What's New for the 2018 BMW 2 Series? Heading into 2018, BMW is adding some minor changes to the already impressive 2 Series lineup of cards. To begin with, on the exterior, BMW has added three new metallic colored paint schemes to the lineup. Four new wheel designs were also added to make the car look that much sharper from the outside. High-gloss black trim and chrome on the switches on the interior bring new life to the already stunning 2 Series on the interior heading into 2018. 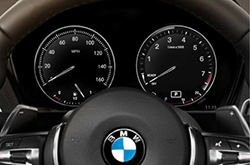 The BMW 2 Series of cars comes available in two basic models: the 230i and the M240i models. Both basic models in the 2 Series offer further customization with both being offered in coupe or convertible options. On top of that, both lines of cars are offered in sport, luxury or M sport body designs to suit the needs of the owner. The third option that each of the basic models offers to consumers is the addition of the xDrive option. The xDrive packages on the 230i and M240i models add a sport exhaust system, wheel-mounted paddle shifters and launch control on the automatic transmissions, making this added package an even greater experience from behind the wheel. The 230i models give drivers the ultimate experience behind the wheel with Servotronic power-steering assist, dynamic stability control, gas-pressurized shock absorbers and spring and strut-type front suspension. The outside of the 230i shines with 17" bi-colored alloy wheels, LED headlights and fog lights, chrome-line exterior trim and a sport style grille. The interior features 10-way power front seats, SensaTec upholstery, floor mats and a high-gloss black trim with chrome accents. A premium sound system with seven speakers and a 205-watt amplifier boost the listening experience with HD Radio. An onboard iDrive system includes a computer, 6.5" screen with a controller and programmable memory buttons. A rear-view camera is also available to the driver. The M240i models give drivers a great experience behind the wheel with variable sport steering, adaptive M suspension from BMW, gas-pressurized shock absorbers and the same spring and strut-type front suspension as the 230i models. The exterior features 18" alloy wheels, LED headlights, aerodynamic kit and a shadowline exterior trim. The M240i's feature the same interior seating features as the 230i series but adds steering wheel audio controls for audio and Bluetooth wireless connection through a smartphone. 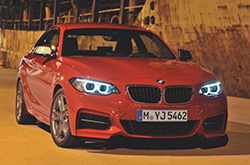 The BMW 2 Series cars feature two powerful engines that give the cars their sporty feels. The 230i engine is an inline 4-cylinder TwinPower Turbo engine that sits at a minuscule 2.0-liters in size. But, the little motor packs a punch with 248 horsepower and 258 lb.-ft. of torque. The larger M240i motor is a 3.0-liter inline six-cylinder motor that chugs out 335 horsepower and 369 lb.-ft. of torque. Both engine options give this powerful sports car all the muscle it needs while cruising down the highway. 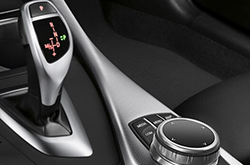 BMW packs many great safety features into the 2 Series line of cars. A rollover protection system minimizes the risk of rollovers in the car. Anti-lock brakes, tire pressure monitoring system, LED daytime running lamps and the BMW Assist eCall system with automatic collision notification give driver's peace of mind when thinking safety on the 2 Series. The car also features LATCH attachments for child seat installation. 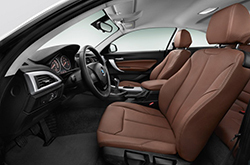 Airbags also surround the cabin of the 2 series vehicles, helping to protect passengers in the case of a crash. 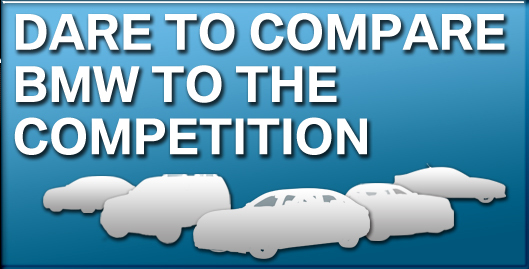 Purchase prices do not include tax, title and license. Prices include the $399.00 doc fee, listed rebates and incentives. Please verify all information. We are not responsible for typographical, technical, or misprint errors. Inventory is subject to prior sale. Contact us via phone or email for more details. *MPG Based on 2018 EPA mileage ratings. Use for comparison purposes only. Your mileage will vary depending on driving conditions, how you drive and maintain your vehicle, battery-pack age/condition, and other factors.